Make way Sherlock Holmes and Nancy Drew! There’s a new detective team in town. 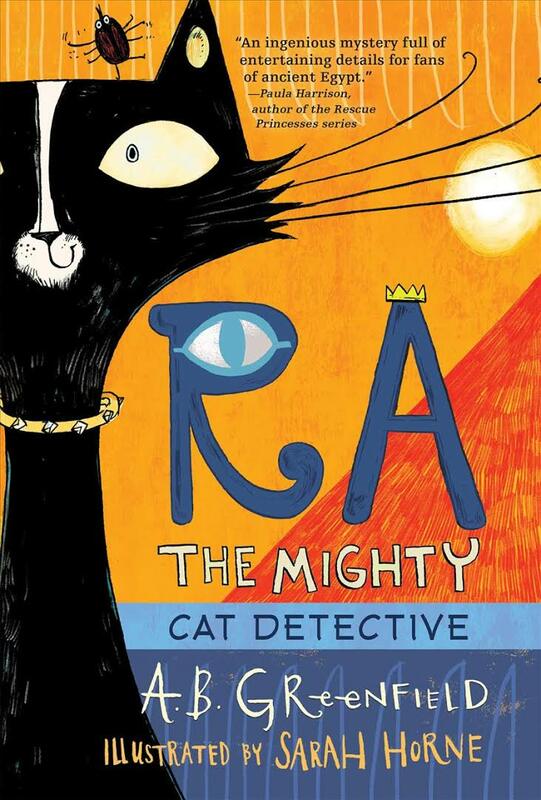 In Ra The Mighty Cat Detective, Ra and his scarab beetle friend Khepri work to save a young servant girl who has been framed for theft of an amulet in a delightful new mystery for young people by A.B. Greenfield. The duo of Ra and Khepri immediately won my affection. Ra is spoiled and lazy, liking nothing better than to sleep and eat 24-7, while Khepri is his hardworking sidekick. When Miu pleas for their help, Ra agrees only because he’s blackmailed by Khepri who threatens to fill Ra’s treats with dung if he does nothing. However, Ra soon finds himself enjoying the thrill of hunting down clues and prowling after suspects. He also shows that buried underneath his selfish demeanor lays a caring heart. The longer he works the mystery, the more convinced he becomes that Tedimut is innocent and doesn’t deserve a death sentence. As for Khepri, he proves himself as more than a sidekick, when he puts his life on the line to save Ra from an aggressive leopard and other dangerous encounters. He also shines as a character in his own right, using his mental prowress to figure out the real thief. The setting for Ra The Mighty Cat Detective fascinated me. Greenfield seamlessly integrated details of ancient Egyptian court life, royal food, religious artifacts, and beloved animals into a comical and engaging adventure. What’s even more impressive is how much rooted in real history the mystery is. In the Egyptian Sculpture Gallery, one can find a statue of a cat and a scarab beetle, and this statue inspired Greenfield’s story. There really existed a Director of the Royal Loinclothes and other important people with long titles. Egyptians loved to serve all kinds of meat delicacies except for fish. Amulets were worn for luck and protection. Finally, Egyptians revered animals–particularly cats and beetles. Cats were often worshipped. As for beetles, they were favored due to Egyptians due to the ability of beetles to roll dung into large balls and to have baby beetles emerge from those balls. I’d be remiss if I failed to mention other elements that I enjoyed. The plot is full of twists and turns. Every time Ra (and I) thought he’d figured out the suspect, a new piece of information proved him wrong. There is a huge cast of characters, especially of animals. Every reader will have their favorite, but mine is Miu, a cat whom everyone should have in their life due to her self-sacrificing and preserving personality. The style is easy-to-read and should appeal to both reluctant readers. At the same time, there’s enough attention to detail that avid readers will also find their attention held. Although I’ve been trying to reduce the number of Advanced Reader Copies I accept, Ra The Mighty Cat Detective is one I couldn’t resist due to the original and fun concept. And now that I’ve been introduced to this new and endearing detective team, I’ll be watching for sequels. Freddy the Frogcaster is back, this time to tell readers about flash floods. In Janice Dean’s newest title, Freddy makes a mistake in his forecast but then later makes up for it by warning residents of an impending flash flood. 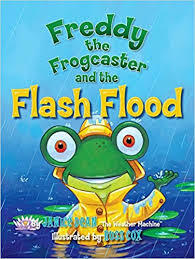 Freddy the Frogcaster and the Flash Flood is another informative and entertaining picture book in Dean’s weather series. Freddy has finally officially become a weekend weather reporter. This pleases him to no end, because he loves thinking, talking, and learning about all kinds of weather. He takes great pride in knowing that the town of Lilypad listens to and trusts his broadcast. Imagine then his dismay when Freddy realizes that the rain had moved north of his town, making his forecast incorrect. Even worse, the townspeople are upset, because they canceled evening events in lieu of the storm. Some of them go so far as to nickname Freddy “False Alarm Freddy”. Readers will relate to how terrible Freddy feels, while also learning through him that it’s okay to make mistakes, and that one should still pursue their dreams. Despite being upset, Freddy returns to his job where he sees that another storm is on the horizon. Freddy once again issues flood watch warnings, and this time his prediction comes to pass. Floodwaters gush over streams and river banks, causing trees to fall and cars to be swept away. Some families have to be rescued. Unfortunately, perhaps due to word constraints, Dean rushes through this part of the story. Readers will learn little else about flash floods in the main narrative, but instead will need to turn to the back pages for this information. While I found this section fascinating, especially the trivia about flash floods being the number one weather-related killer in the United States and the summaries of noteworthy historical floods, I would have preferred more of this data to be integrated into Freddy’s story. Nonetheless, Dean has written yet another engaging story, one that makes weather attractive. The illustrations by Russ Cox remain colorful and reflective of the events in the narrative. Freddy the Frogcaster and the Flash Flood is a good first introduction to the series or a welcome addition for avid fans. 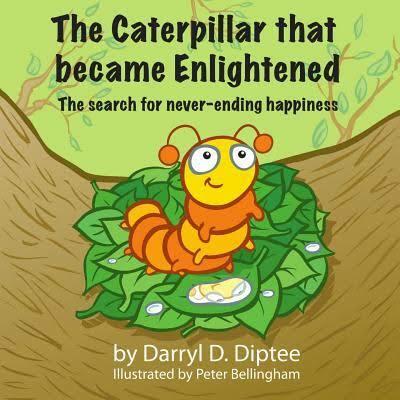 Happiness is the theme of Isoscles’ Day by Kevin Meehan and The Caterpillar That Became Enlightened by Darryl Diptee. In the first, a dog named Isoscles finds happiness when rescued from neglect and abuse. In the second, a caterpillar named Sumi finds happiness not in the world around her but within herself. 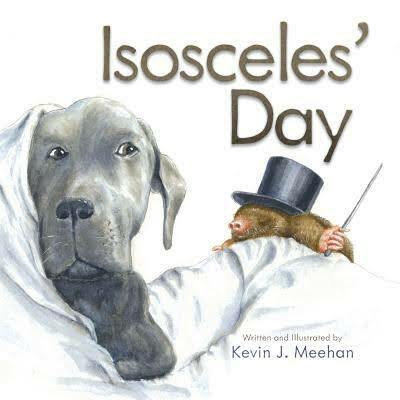 My favorite part of Isoscles’ Day is the inspiration behind the picture book. Isoscles and his sister lived the first few years of their life not being allowed inside and being isolated from people. When his owners abandoned the dogs, Isoscles was separated from his sister but adopted by the author. For the first time in his life, Isoscles was introduced to a warm house and loving people. My second favorite part are the illustrations. Many are so realistic that they look photographs, while others are so whimsical that they made me laugh. I enjoyed seeing Isoscles happy. My final favorite part is the theme. Isoscles’ Day is about one special day in his new life. We see the food, toys, and friends that Isoscles likes. Adults could easily use this picture book as a model to show young readers how to create a book about a day in the life of their pet. Unfortunately, Isoscles’ Day disappointed me in a couple of significant ways. The first way is that the plot tells me nothing about the background of Isoscles except in the end pages. Rip out those end pages and all that’s left is a somewhat bizarre story of a dog told by a random parade of animals. Did the author think that the real story was too serious for children to understand? The other way Isoscles’ Day frustrated me is that the author tries so hard to be funny that at times the story is cartoonish. For example, at one point a frog says, “You are too big to walk on this thread. Would you like to wear my thimble instead?” Again, I have to wonder why the author chose to tell a sweet story in such a fantastical way. There is much I appreciated about The Caterpillar That Became Enlightened. For starters, there is a traditional plot with problems and solutions. Sumi starts out her life by eating leaves like all the other baby caterpillars, but soon finds herself wondering if there’s more to life than just food. She finds a tree and decides to explore it, despite her peers who warn her that the last caterpillar to climb the tree was never seen again. 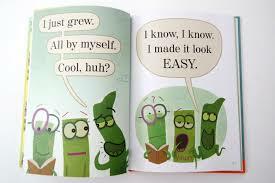 Another aspect of The Caterpillar That Became Enlightened that impressed is how the author simplifies a complex idea and simplifies it for younger readers. Most everyone has at some point in their life found themself dissatisfied with life, despite how rich their life might be with people and possessions. In this picture book, Sumi climbs to the top of the tree and for a while is happy, but then once again finds herself dissatisfied because she’s looking for externals to make her happy. The Caterpillar That Became Enlightened is about the deeper forms of happiness. For Sumi, peace is found by taking deep breaths and clearing her mind, which allows her to feel interconnected to everyone and everything in the world. I’m also not sure what the point of having Sumi turn into a butterfly is, unless to show that people who are content are transformed. Even if I don’t completely agree with the way Sumi found happiness, the author does share an important message in an entertaining format. Nature and animals are themes that run through the following three books. The latter two also contain a message about finding oneself in the world. 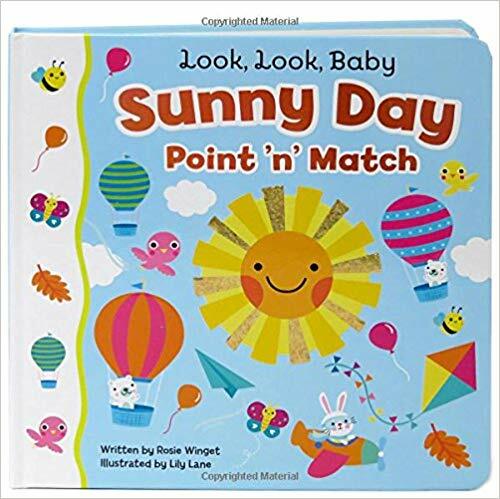 Sunny Day Point and Match by Rosie Wingert is a colorful and sturdy board book that gives parents a fun activity to do with their toddlers. Together families can talk about objects, sounds, seasons, and more. Items to find on the page are illustrated at the top. Inside the cover are a list of other ideas for how parents can use the book, including matching shapes, finding favorite colors, counting related objects, and making sounds from nature. One parent told me that Sunny Day helped their son learn memory and matching skills by age one! Giraffes Can’t Dance by Giles Andreae is a fun story with an inspiring message. Gerald was a tall giraffe whose knees were crooked and whose legs were thin. Unfortunately, while he was good at standing tall and munching shoots off trees, he wasn’t so good at dancing. This was a big problem for the giraffe at the annual dance. The solution is contrived, but readers will find hope in Andreae’s message about self-esteem. In addition, the bold artwork exudes a party vibe and the rhyming text has a lively style that will young readers will enjoy. The One and Only Ivan by Katherine Applegate should be on every animal lover’s list of must-read books. The plot drew me into another world, that of a gorilla who lives in a glass-enclosed display in a mall. Ivan fills his days drawing bananas, watching television, and talking with friends. I loved how Applegate integrated the theme of friendship and of hope. Ivan seems content until a kidnapped baby elephant joins the mall menagerie and his friend Stella becomes sick. Slowly he’s forced to remember his past, and to fight for a better life for himself and his friends. Finally, the short paragraph’s written from Ivan’s perspective are mesmerizing. I quickly found myself loving this easygoing gorilla, who has unique ways of expressing himself. Reprinted with permission from Lincoln Kids. This article is original in content and not to be reproduced without permission. Copyright 2018. When looking for books to read, a perfect place to start is with the award-winners. They’re available for all ages and in all genres. Here are three recent ones. 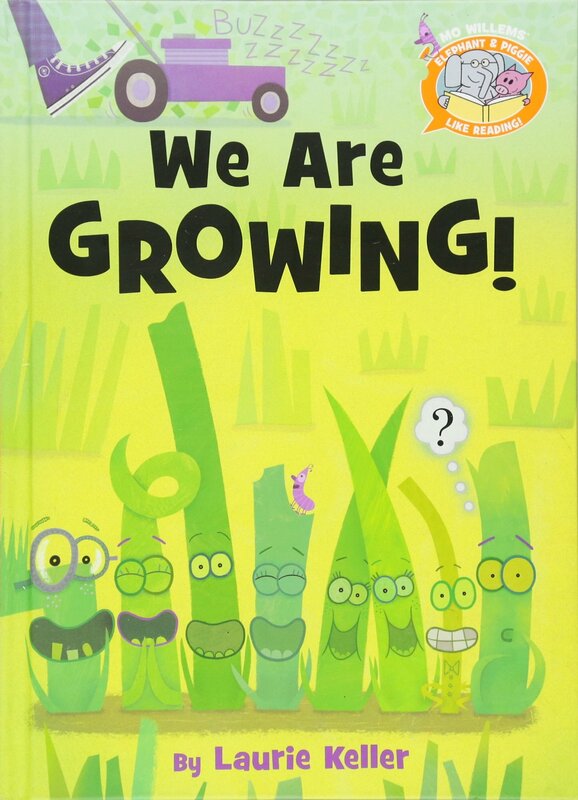 We Are Growing by Laurie Keller bursts with the exuberance one would expect of a winner of the Theodor Seuss Geisel Award. Such exuberance is also perhaps the only way an author could comically write about such a mundane topic as grass. Each blade of grass is growing and proud of being the tallest, the curliest, or the silliest. But one long piece of grass doesn’t know what’s special about him until a lawn mower reduces them to the same size. Through googly-eyed grasses and slapstick moments, Keller gently teaches that we’re all the best at something. Jean-Michel Basquiat grew up drawing with the support of his mom, who would lie with him to draw on old work papers. From her, Basquiat learned that art is found not just in museums and theaters but also in the games he played and the people he met. Basquiat overcame serious injuries suffered when he was struck by a car at age seven, and the institutionalization of his mom at age 13 to become a famous artist. Steptoe captures Basquiat’s life in his rich writing style and creative illustrations. To give meaning to the book’s artwork, Steptoe collected bits of scrap wood from around Basquiat’s home in New York City, and used them as canvases onto which he painted scenes from his book. He also adeptly integrates Basquiat’s favorite motifs into his illustrations. 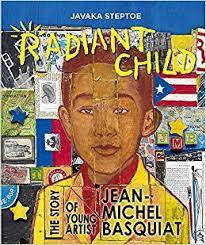 Radiant Child by Javaka Steptoe is a brilliant Caldecott-winner biography! 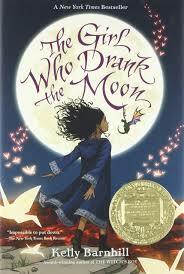 Entrenched in fantasy, complex characters, and poignant themes, The Girl Who Drank the Moon by Kelly Barnhill is impossible to put down. Every year, the people of the Protectorate leave a baby as an offering to the witch that lives in the forest. But nothing is at is seems in this Newbery-winning novel. For example, the witch is kind. She rescues the children and delivers them to welcoming families on the other side of the forest. One year, the witch discovers one of the children possesses magic and decides to raise Luna as her own. But the baby’s mother is searching for her. And the mother meets a man who is determined to free his people from the witch. Eventually, all paths intersect with a message of love.